Located at Pearl Harbor’s Ford Island, a National Historic Landmark and the site of our nation’s first aviation battlefield, the PAM tells the story of military aviation in the Pacific during World War II, Korea, Vietnam War and Cold War. Pacific Aviation Museum’s mission is to develop and maintain an internationally recognized aviation museum, which educates young and old alike, honors aviators and the support personnel who defended freedom in the Pacific Region, and is dedicated to preserving Pacific aviation history. The first phase of the Museum opened in 2007 was 42,442 square feet located within Hanger 37. As you enter the Museum you watch a short documentary on military aviation in the Pacific and the history of Ford Island which was home to not only a naval air field but adjacent to Battleship Row which was the primary target of the Japanese attack on December 7, 1941. You then proceed through a hallway with blowups of old photos and postcards evoking the Oahu of December 1941 prior to the attack. As you enter the main part of the hanger you first see a large artistic interpretation of a Japanese plane preparing to attack Ford Island or Battleship Row. Japanese Zero fighter - The Zero took part in every major action involving the Japanese Navy. It won a series of victories against all types of land and carrier-based Allied aircraft during the first six months after the attack on Pearl Harbor. Army Air Corps B-25 Mitchell bomber - This American twin-engine medium bomber was used with devastating effect against German and Japanese targets in every combat of World War II. The aircraft was named the "Mitchell" in honor of General Billy Mitchell and gained fame as the bomber used in the 1942 Doolittle Raid. 1942 Stearman Biplane - This historic airplane is the actual plane that former U.S. President George H.W. Bush learned to fly in and took his first solo flight in. At the time he was only 18 years old, making him one of the youngest American Aviators in World War II. Aeronca 65TC - This was the first American plane engaged in combat during World War II. As the pilot and his teenage son were enrosute back from Molokai to Honolulu in this pilot trainer Aeronca operated by Gambo Flying Service, they encountered the first wave of 150 Japanese Zero fighters headed to attack Pearl Harbor. Two Zeros circled back and attacked this civilian general aviation plane causing damage to the aircraft. In addition to the historical dioramas, the Museum offers visitors the opportunity to experience the exhilaration of being a pilot by operating a simulated fighter. The experience will enable participants to "fly" an American or Japanese plane and communicate via radio with other flyers while surrounded by a panoramic view of the sky from a pilot's point of view. In January 2011 the Pacific Aviation Museum Pearl Harbor opened a second hangar to the general public. The opening meant that visitors can now explore two WWII battlefield hangars on their own, walking between Hangar 37 and Hangar 79 and viewing points of interest and additional aircraft along historic Luke Air Field. The 85,000 sq. 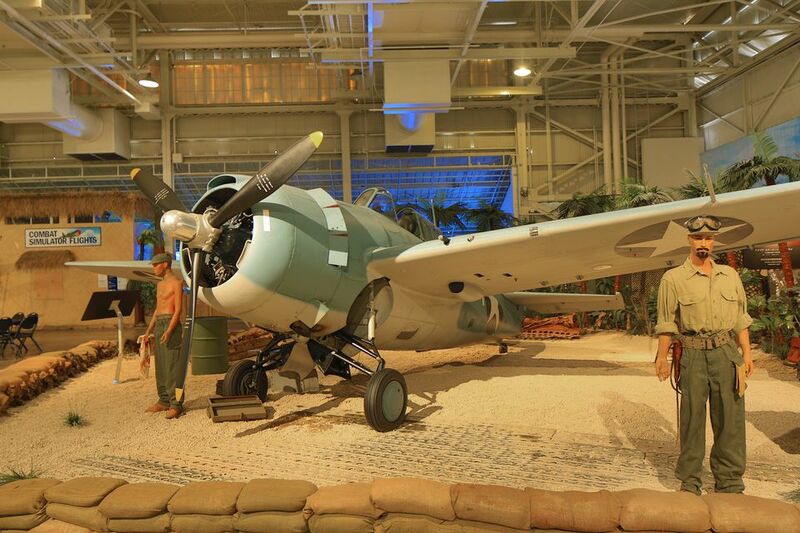 ft. Hangar 79 joins Hangar in providing visitors with a unique aviation experience of America’s Pearl Harbor battlefield. Hangar 79, which still shows the bullet holes from the Dec. 7, 1941 attack, was used to assemble and overhaul aircraft and aircraft engines. Now it is home to over 15 aircraft including many of the museum’s modern jets and historic helicopters. Curtiss P-40E Warhawk (Fighter) - The aircraft is carries the markings of the Flying Tigers, the popular name for the American Volunteer Group (AVG). Led by Claire Chennault, the AVG consisted of pilots recruited from US Forces and contracted with Chiang Kai-Shek’s Nationalist Chinese Air Force. The Tigers are credited with 299 confirmed enemy aircraft destroyed during their service from 1941-1942. Boeing B-17E Flying Fortress (Bomber) - Although best known for leading the war against Germany, Boeing's "Flying Fortress" was the primary bomber during the opening moves of the Pacific War. Japanese fighter pilots were amazed at how much damage the B-17 could endure and keep on flying. Convair F-102A Delta Dagger (Interceptor) - The primary mission of the F-102 was to intercept and destroy enemy aircraft. It was the world’s first supersonic, all-weather jet interceptor and the U.S. Air Force’s first operational delta wing aircraft. At the peak of deployment in the late 1950s, F-102s equipped more than 25 ADC squadrons. Convair built 1,000 F-102s, most of which were F-102As. Bell AH-1 Cobra (Attack) - The AH-1 Cobra is the world’s first dedicated armed attack helicopter. During the early months of the Vietnam War many helicopters were lost to ground fire. The need for an armed gunship to protect unarmed helicopters quickly became apparent. Heavily armed, highly maneuverable, and quick, the AH-1 proved to be a powerful combatant through the rest of the war. Mikoyan-Gurevich MiG-21 (Fighter) - For more than half a century, if aerial combat was going on anywhere in the world, chances are good that MiG-21s were involved. MiG-21s are a family of jets from the Mikoyan-and-Gurevich Design Bureau, a Soviet success story with an amazing production run, from the MiG-21F in 1959 to the MiG-21bis in 1985. A dozen types of MiG-21s have been flown by nearly 40 nations and many are still flying on the front line. Grumman F-14D Tomcat (Fighter) - The Grumman F-14 Tomcat is a supersonic, twin-engine, variable swept-wing, two-seat strike fighter used by the U.S. Navy from 1974 to 2006. The aircraft was designed for air combat in all weather conditions, in day or night missions. Showcasing the Museum’s MiG-15 and F-86 Sabre aircraft which flew during the Korean War, the exhibit features a life-sized diorama that depicts “MiG Alley,” the name given by U.S. Air Force pilots to the northwestern portion of North Korea. The Museum’s F-86 Sabre, which has been restored for the exhibit, and the Museum’s Soviet-designed MiG-15 were the aircraft used throughout most of the Korean conflict. The Museum also contains an exclusive aviator-style restaurant and a museum store where visitors can purchase a variety of gift items including shirts, hats and books. The museum also offers event space for private functions, indoors or outdoors, for up to 10,000 guests. In September 2010, the Pacific Aviation Museum signed the lease on the Ford Island Control Tower and Observation Deck, marking the beginning of a long awaited and badly needed Tower restoration and stabilization project. The Tower stood guard over Ford Island on the day of the Imperial Japanese attack on Pearl Harbor, December 7, 1941. The Ford Island Tower complex constructed in 1941 consists of a 3rd story Aerological Center and Observation Deck on top of the 2-story Operations Building, and the Air Traffic Control Center on top a 158-foot steel water tank tower. The Tower played a major role in the naval activity at Pearl Harbor, especially during World War II. When restoration is complete the Operations Building will house administrative offices, curatorial center, and research library. In order to visit the museum you must park at the USS Arizona Memorial parking lot, purchase a ticket at the nearby USS Bowfin ticket office and then board a shuttle bus at the bus stop in front of the USS Bowfin Memorial. Shuttle buses depart every 15 minutes. Since the museum is on an active Military Base security procedures are in effect. No bags are allowed on the Trolley. You may bring a camera, but no bags whatsoever. A bag storage facility can store your belongings for a fee of $3 per bag. The museum is open daily from 8:00 a.m. to 5:00 p.m.
As of November 2016, admission to the museum is $25 for adults; $12 for children ages 4-12. Admission is free for children under 4. There is a separate charge for the combat flight simulators of $10 for a 30 minute flight and briefing. A special Aviator's Tour of Hangars 37 & 79 is offered which covers all 50+ aircraft, includes both hangars and bullet holes from the December 7, 1941 attack, and facts about Historic Ford Island. Aviator's Tours are available only: at 9:00 a.m., 11:00 a.m., 1:00 p.m. and 3:00 p.m. This 2+ hour tour is well worth the $35 fee for adults and $22 fee for children. Despite the difficulty in getting to the museum, it is well worth a stop for any visitor who truly wants to understand the role of aviation in the defense of freedom. The Pacific Aviation Museum - Pearl Harbor is a non-profit organization founded in 1999 to develop, in conjunction with the U.S. Navy and U.S. Air Force, the first military aviation museum in Hawaii. For more information, visit the museum's website at www.pacificaviationmuseum.org.